search for Author Identifiers: "F-3616-2011"
(71) J. Everts and M. Ravnik, Complex electric double layers in charged topological colloids, Sci. Rep. 8, 14119 (2018). [Abstract] [PDF]. (70) J. Pisljar and M. Ravnik, Lensing and waveguiding in birefringent double-twist cylinders demonstrated using FDTD simulations, Opt. Exp. 26, 26327 (2018). [Abstract] [PDF]. (69) S. Wang, M. Ravnik and S. Zumer, Surface-patterning generated half-skyrmion lattices in cholesteric blue phase thin films, Liq. Cryst., (2018), https://doi.org/10.1080/02678292.2018.1512168. [Abstract] [PDF]. (68) A. Bregar, M. Stimulak and M. Ravnik, Photonic properties of heliconical liquid crystals, Opt. Exp. 26, 23265 (2018). [Abstract] [PDF]. (67) C. C. Tartan, J. J. Sandford O Neill, P. S. Salter, J. Aplinc, M. J. Booth, M. Ravnik, S. M. Morris, and S. J. Elston, Read on Demand Images in Laser-Written Polymerizable Liquid Crystal Devices, Adv. Optical Mater. (2018), https://doi.org/10.1002/adom.201800515. [Abstract] [PDF]. Highlighted as News & Views in Nature Photonics [LINK]. (66) M. Zidar, D. Kuzman and M. Ravnik, Characterisation of protein aggregation with the Smoluchowski coagulation approach for use in biopharmaceuticals, Soft Matter 14, 6001(2018). [Abstract] [PDF]. (65) J. Dontabhaktuni, M. Ravnik and S. Zumer, Quasicrystalline Ordering in Thin Liquid Crystal Films, Materials 8, 275 (2018). [Abstract] [PDF]. (64) S.M. Hashemi and M. Ravnik Nematic colloidal knots in topological environments, Soft Matter 14, 4935 (2018) [Abstract] [PDF]. (63) P. Guillamat, Z. Kos, J. Hardouin, J. Ignes-Mullol, M. Ravnik and F. Sagues, Active nematic emulsions, Science Advances 4,4 (2018). [Abstract] [PDF]. (62) Z. Kos and M. Ravnik, Elementary Flow Field Profiles of Micro-Swimmers in Weakly Anisotropic Nematic Fluids: Stokeslet, Stresslet, Rotlet and Source Flows, Fluids 3, 15 (2018). [Abstract] [PDF]. (61) Z. Kos, M. Ravnik and S. Zumer, Nematodynamics and structures in junctions of cylindrical micropores, Liq. Cryst.44, 2161-2171 (2017). [Abstract] [PDF]. (60) L. Giomi, Z. Kos, M. Ravnik, and A. Sengupta, Cross-talk between topological defects in different fields revealed by nematic microfluidics, Proc. Natl. Acad. Sci. 114, E5771-E5777 (2017). [Abstract] [PDF]. (59) A. Bregar, T. J. White, and M. Ravnik, Refraction of light on flat boundary of liquid crystals or anisotropic metamaterials, Liq. Cryst. Rev. 5, 53 (2017). [Abstract] [PDF]. (58) M. Zidar, A. Susteric, M. Ravnik, and D. Kuzman, High Throughput Prediction Approach for Monoclonal Antibody Aggregation at High Concentration, Pharm. Res. 34, 1831-1839 (2017). [Abstract] [PDF]. (57) S. M. Hasheimi, U. Jagodic, M. R. Mozaffari, M. R. Ejtehadi, I. Musevic, and M. Ravnik, Fractal nematic colloids, Nature Commun. 8, 12106-1-14026-9 (2017) [Abstract] [PDF]. (56) U. Mur, S. Copar, G. Posnjak, I. Musevic, M. Ravnik and S. Zumer, Ray optics simulations of polarised microscopy textures in chiral nematic droplets, Liq. Cryst.44, 679 (2017) [Abstract] [PDF]. (55) M. Cancula, M. Ravnik, I. Musevic, and S. Zumer, Liquid microlenses and waveguides from bulk nematic birefringent profiles, Opt. Express 24, 22177-22188 (2016) [Abstract] [PDF]. Invited contribution to the 30th anniversary Special Issue featuring 30 invited articles, each "written by an early career researcher whose work will help to shape the future of liquid crystals research". (53) J. Aplinc, S. Morris and M. Ravnik, Porous nematic microfluidics for generation of umbilic defects and umbilic defect lattices, Phys. Rew. Fluids 1, 023303 (2016) [Abstract] [PDF]. (52) S. Copar, D. Sec, L. E. Aguirre, P. L. Almeida, M. Dazza, M. Ravnik, M. H. Godinho, P. Pieranski and S. Zumer, Sensing and tuning microfiber chirality with nematic chirogyral effect, Phys. Rev. E 93, 032703 (2016) [abstract] [PDF]. (51) L. E. Aguirre, A. de Oliveira, D. Sec, S. Copar, P. L. Almeida, M. Ravnik, M. H. Godinho and S. Zumer, Sensing surface morphology of biofibers by decorating spider silk and cellulosic filaments with nematic microdroplets, Proc. Natl. Acad. Sci. USA 113, 1174 (2016) [Abstract] [PDF]. (50) Ž. Kos and M. Ravnik, Relevance of saddle-splay elasticity in complex nematic geometries, Soft Matter 12, 1313 (2016) [Abstract] [PDF]. (49) L. Cattaneo, Ž. Kos, M. Savoini, P. Kouwer, A. Rowan, M. Ravnik, I. Musevic and T. Rasing, Electric field generation of Skyrmion-like structures in a nematic liquid crystal, Soft Matter 12, 853 (2016) [Abstract] [PDF]. (48) M Cancula, M Ravnik, S Zumer, Nematic topological line defects as optical waveguides, SPIE OPTO 9384, 938402-938402-9 (2015) [Link]. (47) M Ravnik, M Stimulak, M Cancula, S Zumer, Nematic Defects and Colloids as Photonic Elements, Mol. Cryst. Liq. Cryst. 619, 61 (2015) [Abstract] [PDF]. (46) M. Ravnik and Jun-ichi Fakuda Templated blue phases, Soft Matter 11, 8417 (2015) [Abstract] [PDF]. (45) M. Ravnik, S. Čopar and S. Žumer, Particles with changeable topology in nematic colloids, J. Phys. Condens. Matter 27, 354111 (2015) [Abstract] [PDF]. (44) M. Nikkhou, M. Škarabot, S. Čopar, M. Ravnik, S. Žumer and I. Muševič, Light-controlled topological charge in a nematic liquid crystal, Nature Phys. 11, 183 (2015) [Abstract] [PDF]. (43) M. Čančula, M. Ravnik and S. Žumer, Generation of vector beams with liquid crystal disclination lines, Phys. Rev. E 90, 022503 (2014) [Abstract] [PDF]. (42) M. Štimulak and M. Ravnik, Tunable photonic crystals with partial bandgaps from blue phase colloidal crystals and dielectric-doped blue phases, Soft Matter 10, 6339 (2014) [Abstract] [PDF]. (41) A. Nych, U. Ognysta, I. Muševič, D. Seč, M. Ravnik and S. Žumer, Chiral bipolar colloids from nonchiral chromonic liquid crystals, Phys. Rev. E 89, 062502 (2014) [Abstract] [PDF]. (40) S. Čopar, M. Ravnik and S. Žumer, Janus Nematic Colloids with Designable Valence, Materials 7, 4272-4281 (2014) [Abstract] [PDF]. (39) J. Dontabhaktuni, M. Ravnik and S. Žumer, Quasicrystalline tilings with nematic colloidal platelets, Proc. Natl. Acad. Sci. USA 111, 2464 (2014) [Abstract] [PDF]. also featuread as Front Cover (March 2014 Volume 13 No 3) [www]. (37) M. Ravnik, Topology with Liquid Crystals, Physics 6, 65 (2013) [www] [PDF]; invited APS Viewpoint on the paper B. G. Chen, et al, Phys. Rev. Lett. 110, 237801 (2013) [abstract] [PDF] . (36) S. Čopar, N. A. Clark, M. Ravnik and S. Žumer, Elementary building blocks of nematic disclination networks in densely packed 3D colloidal lattices, Soft Matter 9, 8203 (2013) [Abstract] [PDF]. (35) M. A. Gharbi, D. Seč, T. Lopez-Leon, M. Nobili, M. Ravnik, S. Žumer, and C. Blanc, Microparticles confined to a nematic liquid crystal shell, Soft Matter 9, 6911 (2013) [Abstract] [PDF]. (34) A. Nych, U. Ognysta, M. Škarabot, M. Ravnik, S. Žumer, and I. Muševič, Assembly and control of 3D nematic dipolar colloidal crystals, Nat. Comm. 4, 1489 (2013) [Abstract] [PDF]. (33) A. Sengupta, U. Tkalec, M. Ravnik, J.M. Yeomans, C. Bahr, and S. Herminghaus, Liquid Crystal Microfluidics for Tunable Flow Shaping, Phys. Rev. Lett. 110, 048303 (2013) [Abstract] [PDF]. (32) M. Ravnik and J. M. Yeomans, Confined Active Nematic Flow in Cylindrical Capillaries, Phys. Rev. Lett. 110, 026001 (2013) [Abstract] [PDF]. (31) D. Seč, T. Porenta, M. Ravnik, and S. Žumer, Geometrical frustration of chiral ordering in cholesteric droplets, Soft Matter 8, 11982 (2012) [Abstract] [PDF]. (30) D. Seč, T. Lopez-Leon, M. Nobili, C. Blanc, A. Fernandez-Nieves, M. Ravnik, and S. Žumer, Defect trajectories in nematic shells: Role of elastic anisotropy and thickness heterogeneity, Phys. Rev. E 86, 020705 (2012) [Abstract] [PDF]. (29) I. Dierking, M. Ravnik, E. Lark, J. Healey, G. P. Alexander, and J. M. Yeomans, Anisotropy in the annihilation dynamics of umbilic defects in nematic liquid crystals, Phys. Rev. E 85, 021703 (2012) [abstract] [PDF]. (28) T. Porenta, M. Ravnik and S. Žumer, Complex field-stabilised nematic defect structures in Laguerre-Gaussian optical tweezers, Soft Matter 8, 1865 (2012) [abstract] [PDF]. (27) J. Dontabhaktuni, M. Ravnik and S. Žumer, Shape-tuning the colloidal assemblies in nematic liquid crystals, Soft Matter 8, 1657 (2012) [abstract] [PDF]. (26) M. Ravnik, J.-ichi Fukuda, J. M. Yeomans, S. Žumer, Confining blue phase colloids to thin layers, Soft Matter 7, 10144 (2011) [abstract] [PDF]. (25) V. S. R. Jampani, M. karabot, M. Ravnik, S. Čopar, S. Žumer, and I. Muševič, Colloidal entanglement in highly twisted chiral nematic colloids: Twisted loops, Hopf links, and trefoil knots, Phys. Rev. E 84, 031703 (2011) [abstract] [PDF]. (24) U. Tkalec, M. Ravnik, S. Čopar, S. Žumer and I. Muševič, Reconfigurable Knots and Links in Chiral Nematic Colloids, Science 333, 62 (2011) [Abstract] [PDF]; highlighted as Perspective in Science by R. Kamien [PDF] and highlight paper [www] . (23) M. Ravnik, Colloidal structures in confined nematic liquid crystals, Liq. Cryst. Today, 20, 77-84 (2011) [abstract] [PDF]. (21) T. Porenta, M. Ravnik, and S. Žumer, Effect of flexoelectricity and order electricity on defect cores in nematic droplets, Soft Matter 7, 132 (2011) [Abstract] [PDF]. (20) M. Gomilšek, D. Seč, M. karabot, M. Ravnik, S. Žumer, and I. Muševič, Light-driven oscillations of entangled nematic colloidal chains, Eur. Phys. J. E33, 291 (2010) [Abstract] [PDF]. (19) M. Ravnik, G. P. Alexander, J. M. Yeomans and S. Žumer, Mesoscopic modelling of colloids in chiral nematics, Faraday Discuss. 144, 159 (2010) [abstract] [PDF]. (18) M. Ravnik and S. Žumer, Landau-de Gennes modelling of nematic liquid crystal colloid, Liq. Cryst. 36, 1201 (2009) [abstract] [PDF]. (17) M. Ravnik and S. Žumer, Nematic braids: 2D entangled nematic liquid crystal colloids, Soft Matter 5, 4520 (2009) [abstract] [PDF]. (16) M. Conradi, M. Ravnik, M. Bele, M. Zorko, S. Žumer and I. Muševič, Janus nematic colloids, Soft Matter 5, 3905 (2009) [abstract] [PDF]. (15) M. Humar, M. Ravnik, S. Pajk and I. Muševič, Electrically tunable liquid crystal optical microresonators, Nat. Photonics 3, 595 (2009) [abstract] [PDF]. (14) U. Tkalec, M. Ravnik, S. Žumer and I. Muševič, Vortexlike Topological Defects in Nematic Colloids: Chiral Colloidal Dimers and 2D Crystals,, Phys. Rev. Lett. 103, 127801 (2009) [abstract] [PDF]. (13) M. K. McCamley, M. Ravnik, A. W. Artenstein, S. M. Opal, S. Žumer, G. P. Crawford, Detection of alignment changes at the open surface od confined nematic liquid crystal sensor, J. appl. physi. 105, 123504 (2009) [abstract] [PDF]. 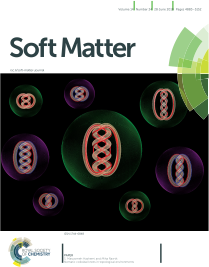 (12) M. Ravnik and S. Žumer, Nematic colloids entangled by topological defects, Soft Matter 5, 269 (2009) [abstract] [PDF]. (11) M. Vilfan, N. Osterman, M. Čopič, M. Ravnik, S. Žumer, J. Kotar, D. Babič, nd I. Poberaj, Confinement Effect on Interparticle Potential in Nematic Colloids, Phys. Rev. Lett. 101, 237801 (2008) [abstract] [PDF]. (10) M. Humar, M. Škarabot, M. Ravnik, S. Žumer, I. Poberaj, D. Babič, I. Muševič, Electrically tunable diffraction of light from 2D nematic colloidal crystals, Eur. Phys. J. E 27, 73-79 (2008) [abstract] [PDF]. (9) M. Škarabot, M. Ravnik, S. Žumer, U. Tkalec, I. Poberaj, D. Babič, I. Muševič, Hierarchical self-assembly of nematic colloidal superstructures, Phys. Rev. E 77, 061706 (2008), also in Virt. J. Nanoscale Sci. & Technol 17 (25) [abstract] [PDF]. (8) U. Ognysta, A. Nych, V. Nazarenko, I. Muševič, M. Škarabot, M. Ravnik, S. Žumer, I. Poberaj, D. Babič, 2D Interactions and Binary Crystals of Dipolar and Quadrupolar Nematic Colloids, , P hys. Rev. Lett. 100, 217803 (2008) [abstract] [PDF] . (7) M. Škarabot, M. Ravnik, S. Žumer, U. Tkalec, I. Poberaj, D. Babič, N. Osterman, I. Muševič, Interactions of quadrupolar nematic colloids, Phys. rev. E, 77, 031705 (2008) [abstract] [PDF]. (6) M. Ravnik, M. Skarabot, S. Zumer, U. Tkalec, I. Poberaj, D. Babic, N. Osterman, and I. Musevic, Entangled Nematic Colloidal Dimers and Wires, Phys. Rev. Lett. 99, 247801 (2007) [abstract] [PDF]. (5) M. Skarabot, M. Ravnik, S. Zumer, U. Tkalec, I. Poberaj, D. Babic, N. Osterman, and I. Musevic, Two-dimensional dipolar nematic colloidal crystals, Phys. Rev. E 76, 051406 (2007) [abstract] [PDF]. (4) M. K. McCamley, G. P. Crawford, M. Ravnik, S. Žumer, A. W. Artenstein, S. M. Opal, Optical detection of anchoring at free and fluid surfaces using a nematic liquid crystal sensor, App. Phys. Lett. 91, 141916 (2007) [abstract] [PDF]. (3) I. Muševič, M. Škarabot, U. Tkalec, M. Ravnik, and S. Žumer, Two-dimensional nematic colloidal crystals self-assembled by topological defects, Science 18, 954-958 (2006) [abstract] [PDF]. (2) M. Škarabot, M. Ravnik, D. Babič, N. Osterman, I. Poberaj, S. Žumer, I. Muševič, A. Nych, U. Ognysta, and V. Nazarenko, Laser trapping mechanisms in nematic liquid crystal colloids, Phys. Rev. E 73, 021705 (2006), [abstract]	[PDF]. (1) P. Kossyrev, M. Ravnik, S. Žumer, Branching of colloidal chains inside supramicrometer capillaries, Phys. Rev. Lett. 96, 048301 (2006) [abstract]	[PDF].